Young whiz kid Jimmy's (Thomas Horn) dreams come true when he gets an invitation to space camp, though he tricks his parents (Dermot Mulroney and Mira Sorvino) in order to attend. While there he gets a chance to compete with other brainiacs under the tutelage of former astronaut, Captain Buck Manley (Josh Lucas). Jimmy and his team of genius misfits are on the fast track to winning the highest honors when Jimmy's parents find out the truth and pull him out of camp. It's only when NASA's Commander Phillips (Danny Glover) needs a fast solution to a real-life disaster that Jimmy gets a chance to redeem himself. But will he be able to keep his cool under immense pressure? This is a film I found at Big Lots. I was surprised to find the Blu-ray/DVD Combo for only $3.00! The fact that it was so dirt cheap had me worried it was a real bomb. But even by just reading the overview on the back of the case I thought this could be a good companion piece to SpaceCamp. And the fact that Danny Glover is in it didn't hurt matters. I figured for only $3 it was worth a try. And I must say... I am glad I gave it a chance.... as I really did enjoy every minute of it. It is well worth the time put in to watch this film. I can see myself watching this again before too long as a double feature along with SpaceCamp. 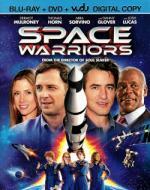 If you like SpaceCamp I urge you to give this film a chance. You won't be sorry. I remember seeing this in Walmart..hmm...probably a few months ago. It sounds interesting.